I wrote this poem this morning…it came to me as a song. I am not a musician, but what can I say…I just write what comes. God bless America. Thank you Lord, for this great country, for all the sacrifices and bloodshed it has endured. For all the hope it has shared, for the dreams, visions and hopes you Our Father have had for this adopted child. 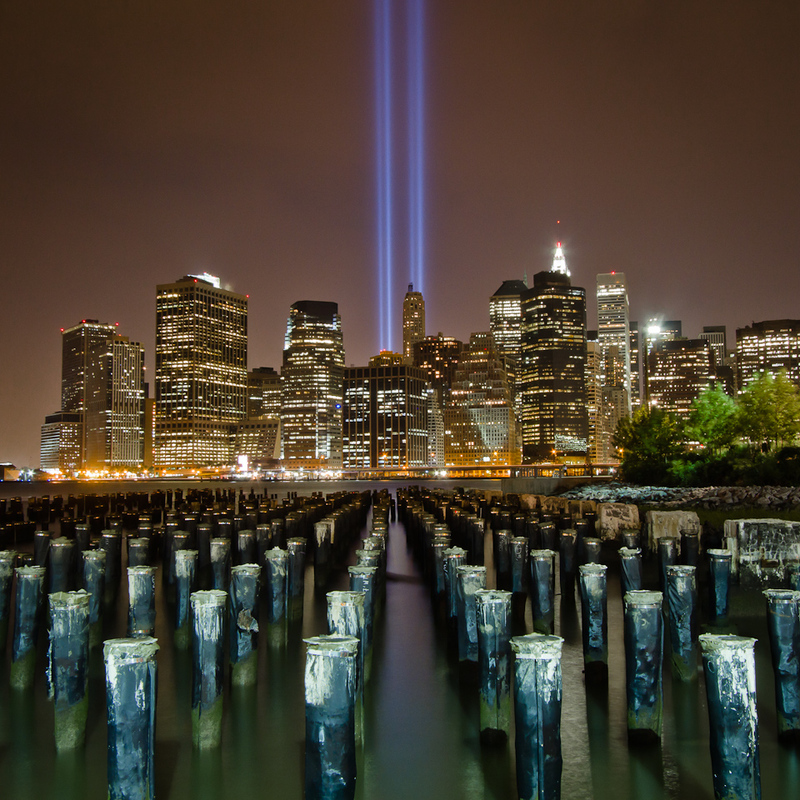 Today I watched livestream coverage of the 9/11 Tribute from New York City. My heart aches new each year in light of the historical aftermath of the tragic events that unfolded on this date fourteen years ago. What is in my heart, and on my mind in light of all, is better expressed for me in my default writing mode: poetry. So today, I offer my words as a tribute for those who have lost loved ones, who still ache daily, and for us all in this Great Country…may these words bring hope, healing, encouragement or a sobering reminder if need be. May these offerings be accepted, and acceptable to you who read them today. May God continue to bless us, because none of us are worthy, yet we all, with open hands, receive His grace. I journal pretty much every day. Occasionally I may be too busy or just need some time to digest life as it is fed to me, before I can safely articulate my thoughts and feelings. Such was the case, in the events of September 11, 2001. Writing is such a connecting point for me. It’s like breathing. My breath had been taken away and it was beyond a measurable expression for me to comprehend, let alone, write. It touched me too deeply, as it did us all. I remember it was also the week my daughter was to be Dedicated at our church. The date of that event as 9/16/2001, five days after 9/11. How vulnerable I felt. How vulnerable we all felt. I felt connected to my fellow Americans and unsure of the future as I stood before the congregation and with my precious child. I decided to share my unedited journal entry in remembrance of the day that took my breath away.Our breath away. If you are reading this, please know, this is my heart, unedited. Handle with care. I usually write for an audience of One, who knows me, my rambly mind and all. Please keep that in mind! Thank you Lord for today. It has been hard for me to write lately…Lord you know my inmost parts, my inner-most being. I almost don’t have words in light of the recent tragedies on our country. Where are we now…I haven’t been able to write in my devotional book for Katherine because I kept wondering, how do I write about this? But I must…and then I realized that I can teach her about the depravity of man and the sovereignty of God. Yet these are not small concepts. There is so much going through my mind…I think I am sick processing what it all means to me. I just can’t imagine the horror of what many have and are going through (in New York) and I confess it all seems unreal to me. Almost surreal. Our country, having been attacked by terrorists flying planes into buildings in New York and Washington by “Suicide Bombers”. But I know God is in control. Yet I understand so little. And I must focus on the details of life…and I have – yet everyone in the country is changed by these events…People are really freaked out – But my God, I do trust in You. What I have seen happen in this country is amazing, powerful. 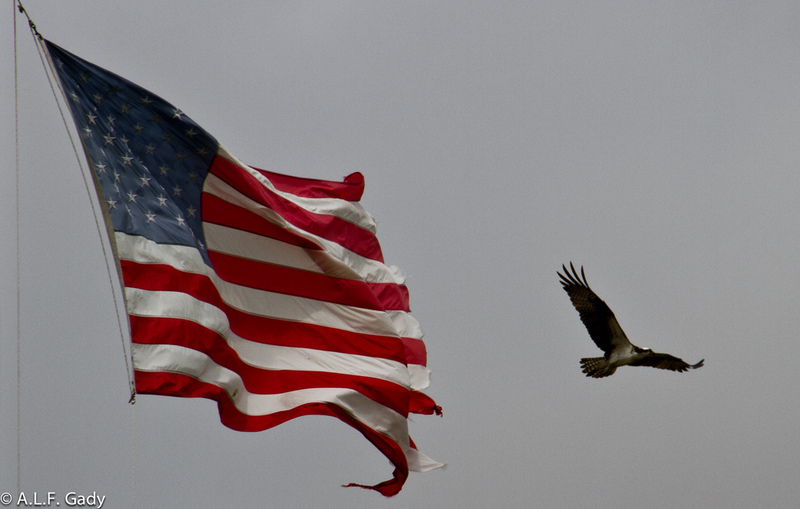 There is a revival in Patriotism. Flags are everywhere. I remember as a school child we recited “I pledge allegiance to the flag of the United States of America”… I can barely remember it now – and do schools even do that anymore? I pray and hope they do and will. God You are doing something amazing – I don’t know what – but, Lord, thank you for America, my president, his wife. Thank you for freedom and liberty. Forgive me Lord because I have taken so much for granted. I have grumbled and complained when I should have been grateful and prayerful. Thank you for your mercy. May God Bless America, Land of the Free and the Home of the Brave. In memory of those who gave their lives, lost their lives, and those who continue to suffer due to the sacrificial giving and dedication they shared in service and to each and every one of their loved ones. I remember. 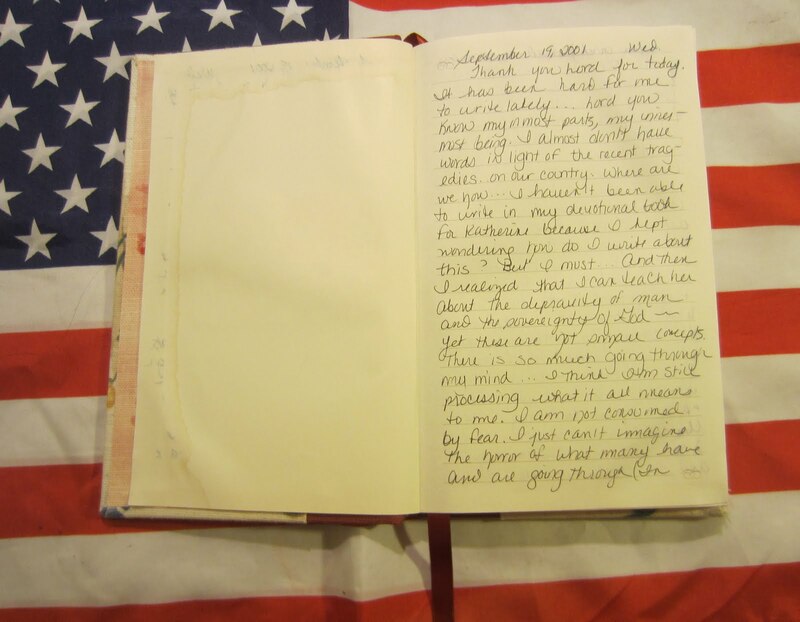 I have posted this journal entry on September 11 as a remembrance since I began blogging in 2011. This is the third year I have shared. attempt to express myself in a journal entry. and I am feeling a bit overwhelmed ! “recalculating” as to what is realistic for me with fitting in what God wants at this time and perhaps scraping off the plate any excess not on His menu for me. Some of you may have seen this post prior to now but I thought it would be appropriate to link up this Journal for our Random Journal Day this month. 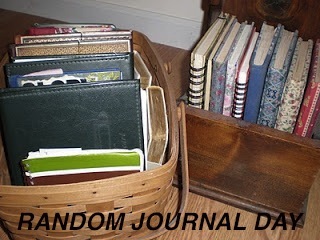 I posted this before we had Random Journal Day- so perhaps you missed it the first time around. Without further adieu – nothing like being late to your own party, right? my heart, as I try to grasp the events of 911. The year they happened. I journal pretty much every day. Occasionally I may be too busy or just need some time to digest life as it is fed to me, before I can safely articulate my thoughts and feelings. Such was the case, in the events of September 11, 2001. On this 10 year anniversary of the events of that day, I dredged out my journal to see how I actually expressed what I remember so well. Except, as I looked for the entry I realized that it took me a full week before I was feeling I could write. Writing is such a connecting point for me. It’s like breathing. My breath had been taken away and it was beyond a measurable expression for me to comprehend, let alone, write. It touched me too deeply as it did us all. I remember it was also the week my daughter was to be Dedicated at our church. The date of that event as 9/16/2001, five days after 9/11. How vulnerable I felt. How vulnerable we all felt. I felt connected to my fellow Americans and unsure of the future as I stood before the congregation and with my precious child. 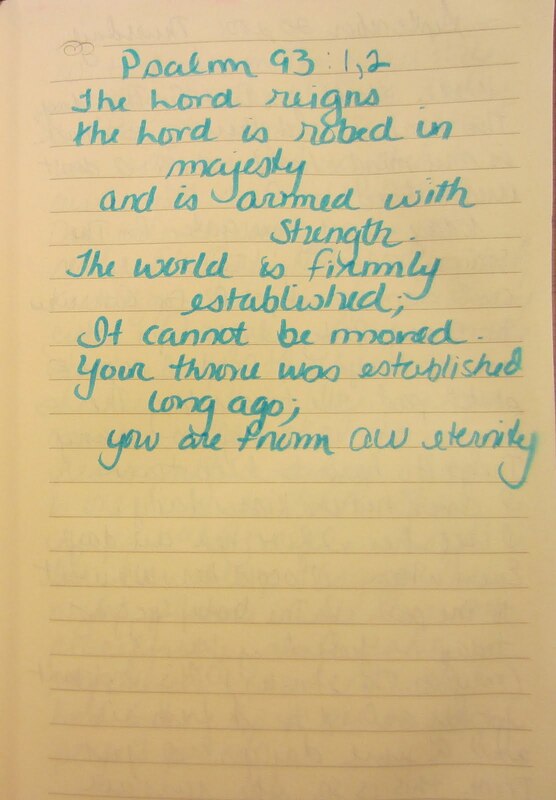 I decided to share my unedited journal entry in remembrance of the day that took my breath away. Our breath away. If you are reading this please know this is my heart, unedited. Handle with care. I usually write for an audience of One, who knows me, my rambly mind, and all. So keep that in mind! shared in service and to each and every one of their loved ones. 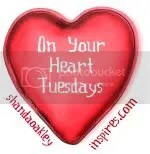 Join us for more journal shares HERE!